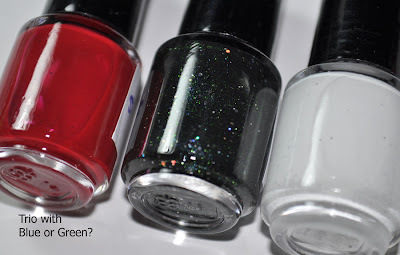 Home » franken » sale » Frankenpolish Sale! US First Class $3.00: Up to 4 full size bottles, or 3 full size + 1 mini set. US Priority $11.00: Anything over 6 bottles can go in this medium flat rate box. 6 full sized bottles, or 5 full sized + mini set. If you really really want me to jam 7 in there it may be possible but there is a chance something might break! That is the max you can order for international, unless you want to pay medium flat rate which I think is astronomically high. 1 coat over a blue creme. Fuchsia, merlot and green superfine glitter in a pale blue base. Looks really good over a dark shade! 2 coats. Rich burgundy with a golden shimmer and flecks of basil green superfine glitter. 2 coats. Shimmery berry/purple with green and fuchsia superfine glitter. I did a full manicure with my sample bottle and the glitter did lump up a bit. So please apply 2 thin coats or layer this over a similar color. 2 coats. 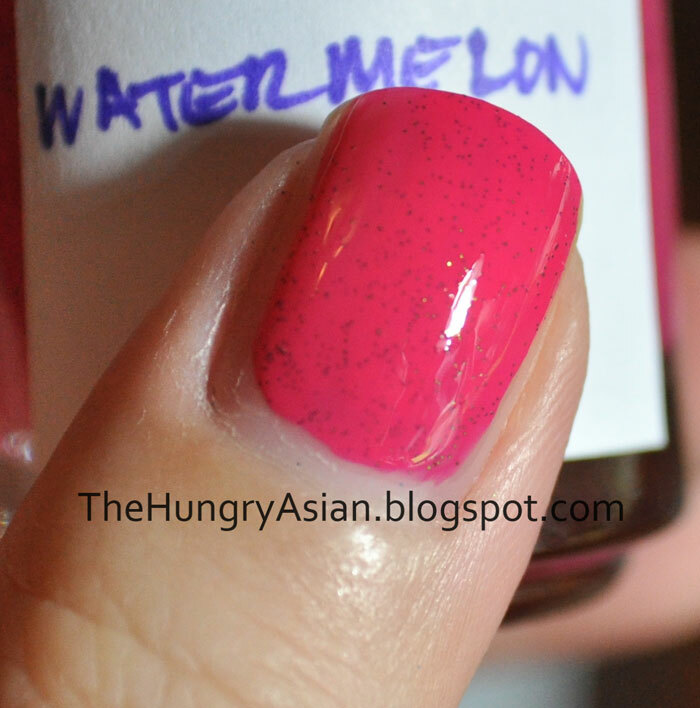 This one is a pale teal with fuchsia and dark maroon glitter in a clear base. 2 coats. 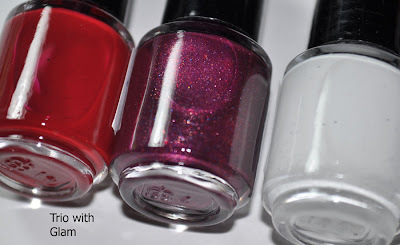 Raspberry shimmer with red and lilac superfine glitter and flakies. This one is not 3 free (Colorama flakies used). Who Gave You This Black Eye? 2 coats. 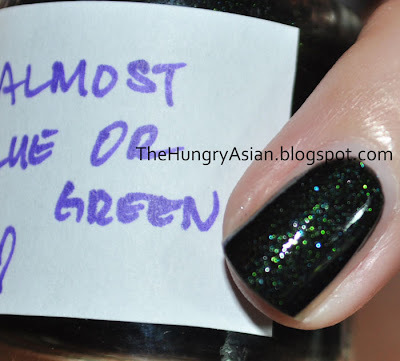 Almost black base with a golden/olive shimmer and superfine aqua blue glitter. 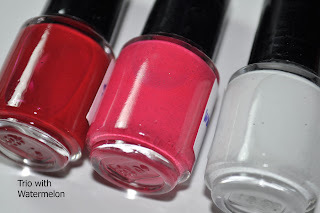 I hit the table after this swatch hence the speed bumps! 2 coats. This was most of my dark colored glitters in a bottle: brown, orange, copper, bronze, dark navy blue and a bright blue. This shot is more color accurate, 2 coats. 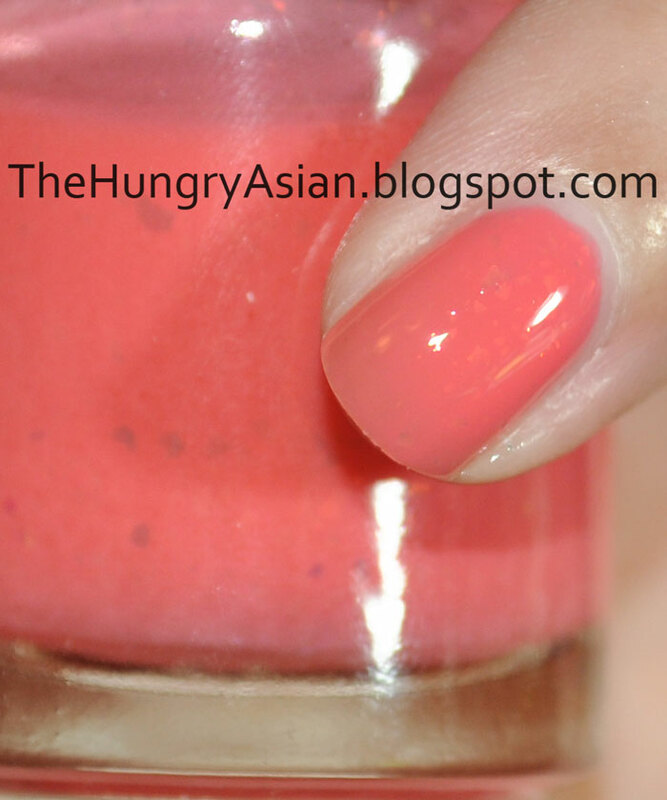 This is a pinky coral color with flakies. This may look more pink or more orange depending on your skintone. 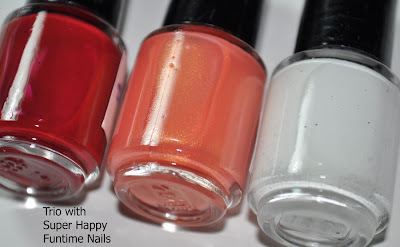 This is not 3-free since I used a bottle of a Colorama flakey polish. 2 coats. Teal shimmer with light and dark blue superfine glitter. Named Psi Storm for my love of Starcraft. It looks like protoss blood, eeew! 3 coats. This is the modified version with less orange more pink. I think it is now a more balanced out coral color. It has a great golden shimmer! 2 coats. 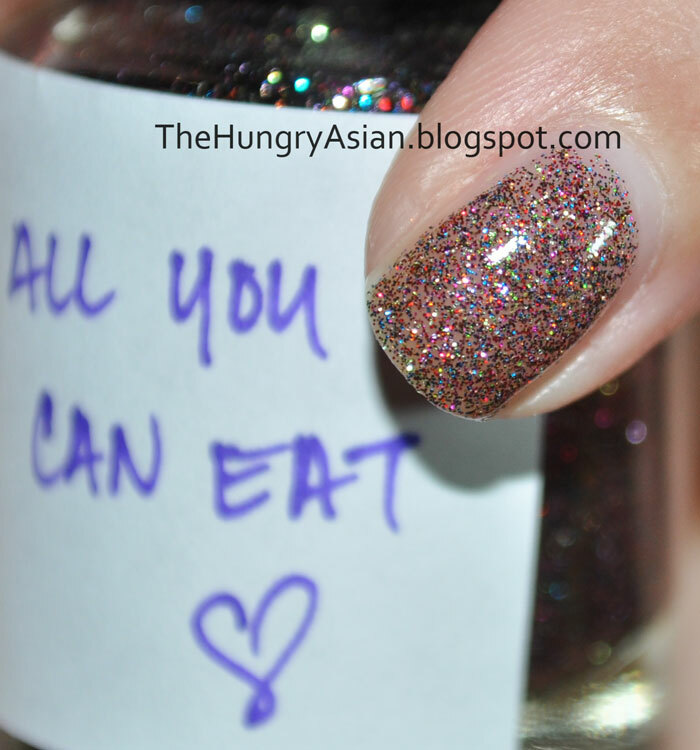 Golden holographic glitter in a dark black base. You can apply 2 coats or layer over black or another dark color to get this look. 2 coats. Dark royal blue superfine glitter and larger gold holographic square glitter in a clear base. 1 coater! 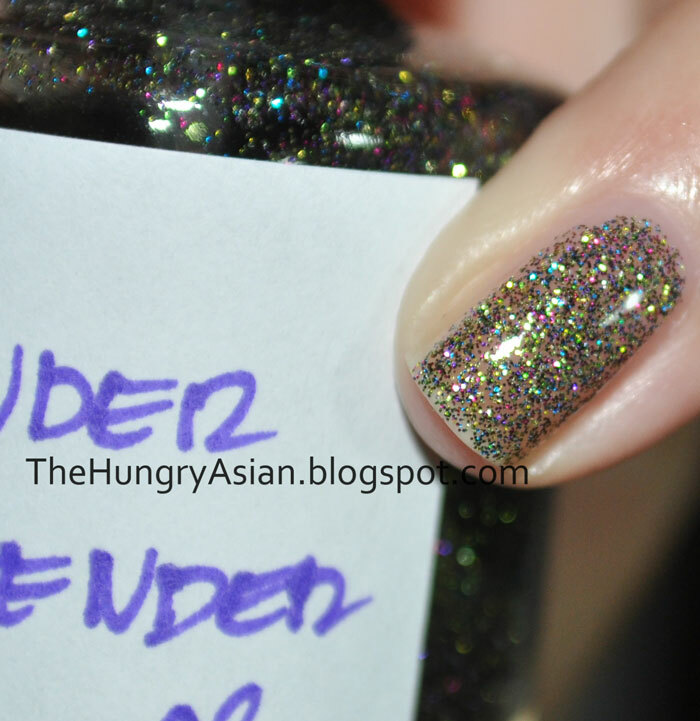 Purple and iridescent glitter in a black base. This one is very thirsty so make sure you do the topcoat sandwich. 2 coats. This is a pinkish peach and pale green glitter in a clear base. They kind of blend in together it looks golden. 2 coats. Reddish orange superfine glitter with silver holographic hex glitter in a clear base. 2 coats. Eggplant creme with lilac and pale sky blue superfine glitter. 2 coats. 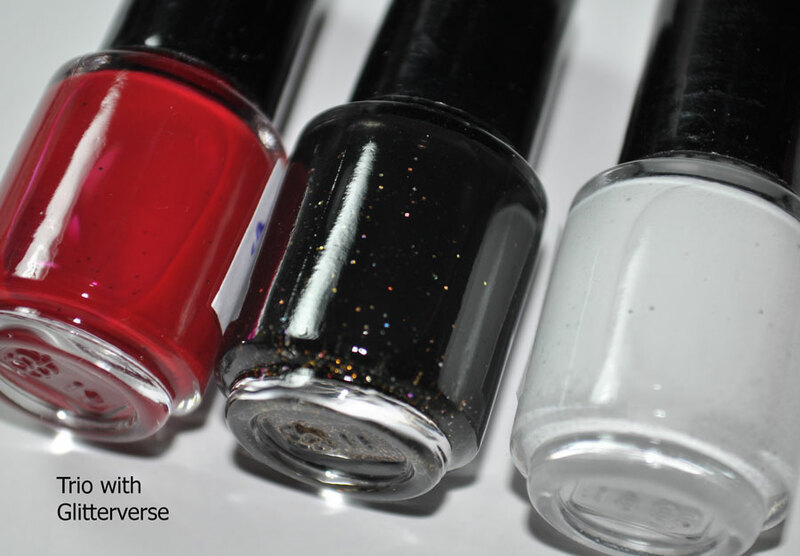 One of my most popular shades, shiny red with black small hex glitter. 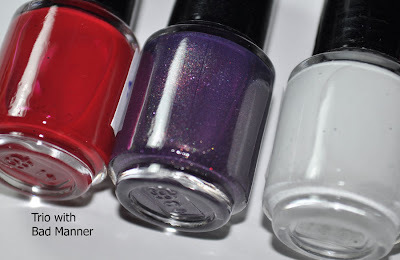 2 coats, far left swatch. Blue and black superfine glitter in a clear base. 2 coats. I always wanted a kiwi to go with strawberry! This is a lime green with a shimmer. 2 coats for both swatches. This is a totally original name, what are you talking about?! Blood red superfine glitter and small black hex glitter in a clear base. 1 coater! 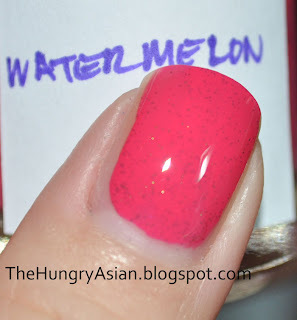 Bright pink creme with superfine dark green glitter. Very left swatch, 2 coats. I wanted to make a glitter that has every single color I own. Remember getting sodas from 7-11 and putting a little bit of each flavor in your cup? Ooooh. 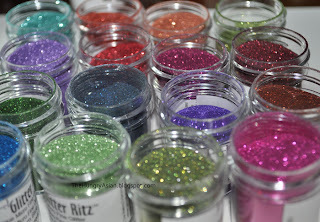 So how many glitters do I have? Each bottle has a heaping scoop of every single color shown here! 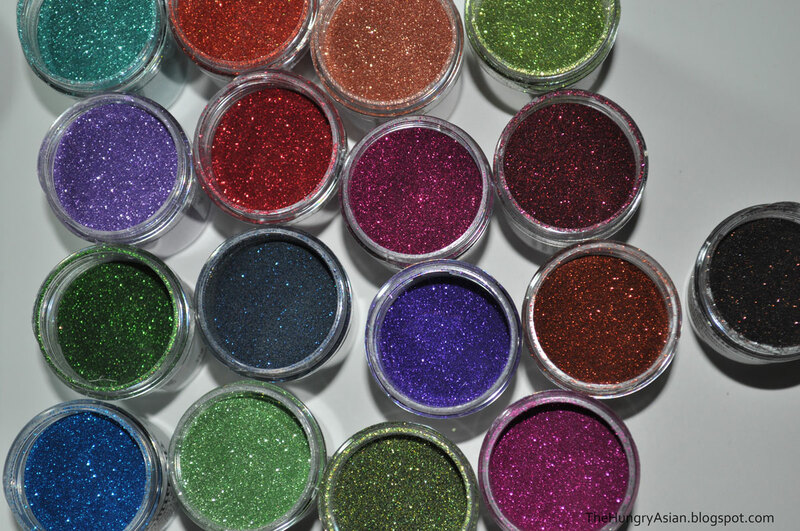 I love both of their glitters, they don't bleed and melt away, they're cosmetics grade and they have a huge color selection. Oh yeah, so back to the polish. 2nd from the left, 2 coats shown. Superfine lime green, bright blue, yellow and fuchsia glitter in a clear base. 2 coats shown. Is it blue, or is it green?! This is almost like the original except it is missing large silver hex glitter. It has green and blue glitter and shimmers, well, blue and green! All proceeds go to Red Cross Japan, thank you for your support! Trio with Blue or Green?